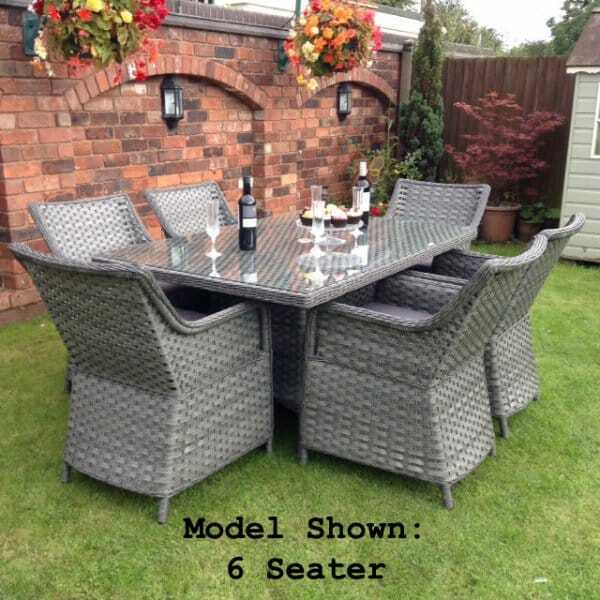 Victoria Rectangular Rattan Seater Dining Set: The Victoria Rectangular Rattan 6 or 8 Seater Dining Set is a wonderful outdoor dining set which will be the must have addition for your patio or garden space. The rectangle table is topped with toughened glass and features a parasol hole for when you may want to dine in the shade. The chairs are a curved design and are perfect for leaning back to relax, the woven synthetic rattan is supportive and comfortable to sit in. The synthetic rattan is a perfect material for outdoor use as it’s durable and hard-wearing and requires little maintenance. There’s plenty of room for you and friends to relax around this table, a lovely way to enhance your outdoor dining lifestyle this season.